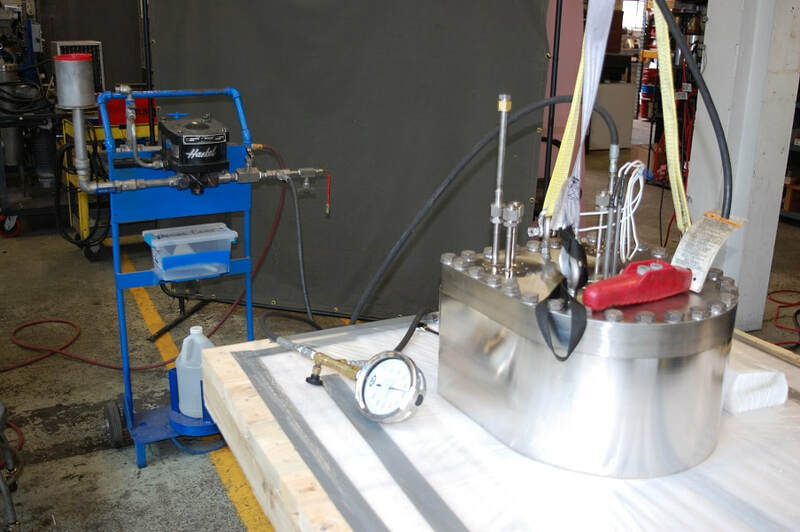 Hydrostatic Pressure Testing Services | Meyer Tool & Mfg. - Meyer Tool & Mfg. Hydrostatic pressure testing is performed by sealing off a pressure vessel except for a single entry port. Deionized water is poured into the chamber until it is full of water. The chamber is oriented in such a way to eliminate the presence of trapped air inside the vessel. A hydraulic pump cart is then attached to the vessel in order to bring it up to a pre-determined test pressure. The pressure is held for a predetermined amount of time to ensure that there are no leaks around the welds or ports on the vessel. The hydraulic pressure test is inherently safer than an pneumatic test in that a failure on a hydro-static test would mean a few drips on the floor. A failure on a pneumatic test could result in a catastrophe explosion. There are some instances where a pneumatic test is preferred or required in that exposure to the hydraulic fluid could pose issues to the quality requirements of the chamber. Once the hydro-static test is complete the vessel is drained and disassembled so that it can be thoroughly cleaned. The vessel is then reassembled and packaged for shipment. Filling a custom pressure vessel with de-ionized water in preparation for hydro-static test. Hydro-static pressure testing of a Hastelloy pressure chamber.